Best. Adult & Corporate Event. Ever! Whether you are planning a team builder, quarterly meeting, holiday party or a large scale event for up to 1500 guests, let Big Al’s handle all the details, so you can sit back, relax and take all the credit! Meetings – FREE Wi-Fi, AV, projector & screen, mic & PC connection for all your meeting needs. Company Picnics – Don’t let the weather put a damper on your picnic; enjoy family friendly fun for all! Exclusive Events – Plenty of space & FUN for up to 1,500 guests plus plenty of free parking! Holiday Party – Festive & fun! 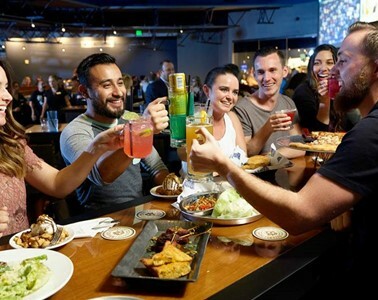 Our holiday parties include a dinner buffet & VIP galaxy bowling in The Ocho or choose the upscale BoardRoom with endless entertainment options and bar games galore! 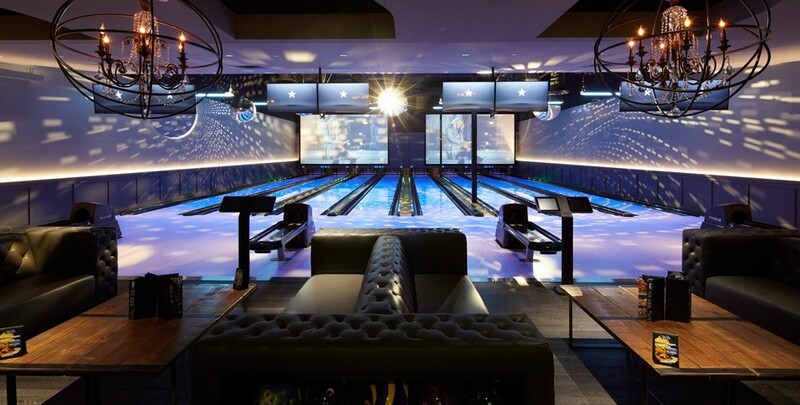 Bowl in style in our exclusive Ultra Bowling Lounge, ‘The Ocho’. 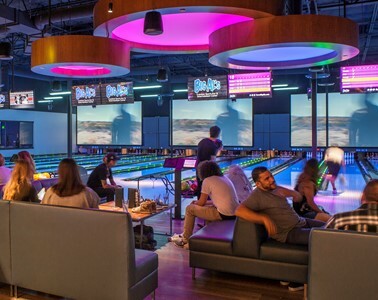 Enjoy a VIP galaxy bowling experience for 12-80 guests. Up to 8 lanes can be all yours! It’s a perfect set-up for any party size that allows both interactive activities and a place for folks to gather & eat away from the action. -Add additional Party or Arcade cards in $5 increments. -May sub Party Card (Bar Credit) value for Arcade play. -The Professional Party Package is available Sunday-Thursday only. *12 Person Minimum for Events Bookings. Package Prices do not include state sales tax or service charge (22%). Dietary options available for gluten-sensitive, vegan & vegetarian guests. Holiday Menu Available November through January. Please note that some Events may share space in The Ocho, on The 12s, or in The BoardRoom, depending on size of party. Enjoy endless entertainment options in our exclusive BoardRoom. 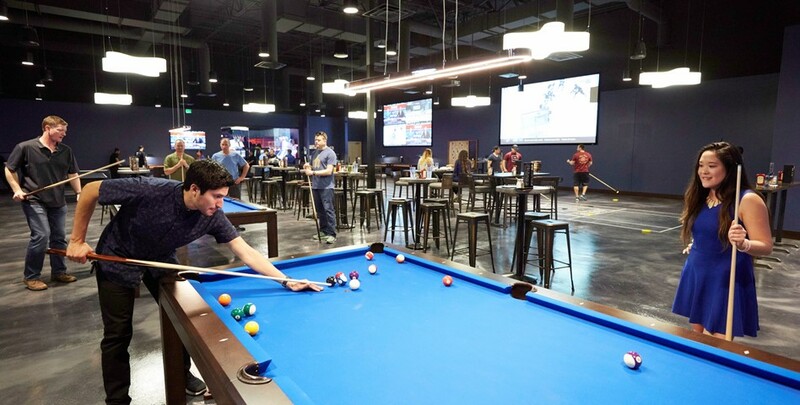 Perfect for groups of 100 or more guests, the BoardRoom features large HD screens and countless amenities including pool tables, floor & table shuffleboards, pub-style darts, a private bar, ping pong, giant Jenga, pop-a-shot, and more! The BoardRoom accommodates 12+ guests and can either be rented exclusively or partitioned based on the size of your group. -Party Snacks include Savory Spicy Chex Mix + Salt & Pepper Chips. -Add bowling in the 12's, $40/Lane/Hour with shoe rental included. *Package Prices do not include tax or service charge (22%). Dietary options available for gluten-sensitive, vegan & vegetarian guests. Holiday Menu Available November through January. Please note that some Events may share space in The Ocho, on The 12s, or in The BoardRoom, depending on size of party. Enhance any party package by adding on appetizers, desserts, and entertainment options. 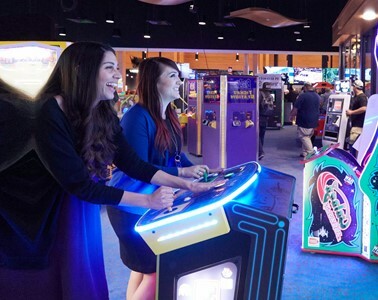 From Arcade Cards to our Famous Nachos and all new s’mores bar; we have options to enhance any party. Start with one of our ‘theme’ buffets or customize your own! We can work with every group size & budget to pull off the Event you’re looking for. With Budget-Friendly packages starting at $25 per guest, we can pack a ton of FUN into your next event without breaking the bank. That’s right. Big Al’s can be all yours! Enjoy exclusive use of every square foot. Let our staff plan & host your event from start to finish so you can sit back, relax & take all the credit. 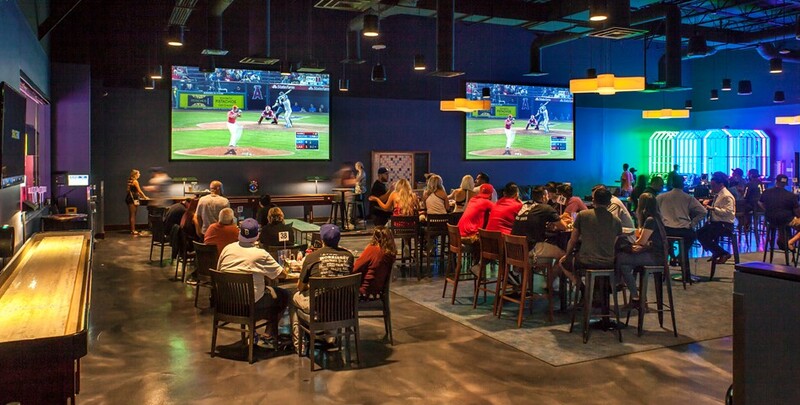 No event is too BIG at Big Al’s! Download our Event Planning Guide here.